It’s been about five years since the term “civic hacking” was coined. We have experimented and learned a lot while taking part in different communities involved in this philosophy, movement and culture that seeks to integrate and make the most of the abilities of digital technology developers in the enabling and reinforcement of solutions to social problems. May 2014 had two events that involved intense reflection: first, PoplusCon in Chile, and then sessions on strategy and hacking at CodeCamp, organized by ICFJ in the north of Italy. And even if reflections didn’t end there, it is important to be clear on the lessons we have learned (and thus avoid the bad practices and encourage the best ones), and on where we should keep working as a community. What do we know that works for sure? Multidisciplinary approaches: Social impact does not happen solely through the inputs given by technological specialists. The design of products and solutions must contemplate the final users from its conception, so that the specific demands of the users are truly satisfied. And during the design and testing process, it is fundamental that the inputs of subject specialists, goal users, technical specialists and designers with experience in usable interfaces are taken into consideration. Undertake projects, not products: To ensure that a good product or technological solution will have the desired impact, we must contemplate actions that are not associated per se with the development of the product. Just as it is key for product design to ensure the highest possible level of interaction and testing with the groups involved with the potential use of the product, you also must plan and assign resources for the actions towards the publicity, positioning and dissemination of the product or service to encourage its adoption. Design events based on the expectations: From many outbursts of love and hatred that arise from events like hackathons, it is clear nowadays that the format of each event must be decided based on the purpose (expectation) of the gathering. For example: if the goal is to analyze data, you can do data expeditions; if the goal is to generate applications with a given purpose, you can organize hackathons based on specific challenges; if the goal is that participants learn, you can include workshops before the work sessions; if seeking solutions for problems is the goal, you can implement “ideathons” or workshops following design thinking methodologies. And just as it is key to select activities types for each event, it is also important to summon the profiles of the participants needed to fulfill the purposes of the events. 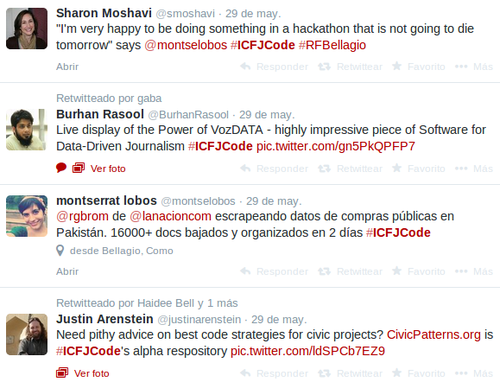 Cultivate communities: It is said that the best part of all events on civic hacking is what happens after them. The more linked the technical, civic, academic and design communities are, the more probable it becomes that there will be collaborations to develop new projects and initiate innovation processes. Also, communities in constant communication often share experiences and influence each other, improving their processes and products. What do we know that DOES NOT work? Viewing the tool as the project: Social impact is generally accomplished when there is a series of actors and factors that enable desired change in society. Many times, it is thought that with the existence of a website, application or any technological application, social impact will be achieved. Let us remember that civic hacking enables the creation of tools, and as such, they will be useful only when they reinforce, optimize or energize the actions that social change actors undertake. Unilateral focus: Isolated efforts (often from technological groups) are truncated by the lack of use given to products and services. When these products or services are created without involving target users, it is common that there is no demand for them, that there are technological adoption barriers on the side of the users, or that they lack the attributions that are really required to enable the actions of the agents of change. Frankenstein development: It is common that many resources and efforts are assigned to develop the ideal technological products to solve a great quantity of needs. These products are often designed from the inputs of the same development groups or their “clients” (that could be final users, intermediate organizations or project sponsors) that, from a theoretical perspective, insist that the tool can solve it all. The outcome is often the development of highly complex tools, normally underused by the final users, and with high levels of discontent amongst the developers and clients after many months of fights, misunderstanding and exhaustion derived from countless sessions of work and changes. What should we keep talking about, articulating and improving? How NOT to re-invent the app: Event after event and project after project, it is seen that there are very similar products and services being developed around the world. Before thinking about developing something, we should ask ourselves if the demand for such product or service really exists. Many times it already does, and many more, somewhere else in the world something similar has been developed. If that similar thing is adapted and improved, it could be used to reinforce the actions of the agents of change that we wish to enable. Let’s re-use the code: There already are standard and adequate solutions for many of the challenges of the daily civic hacking (for example: congressional follow-up, bicycle routes, mapping of citizen complaints, systems of medical reports, etc) that we can use as a basis (and even improve). The more linked the communities of civic hackers are at the international level, the easier it will be to share code, establish the standards and solve the complexities. 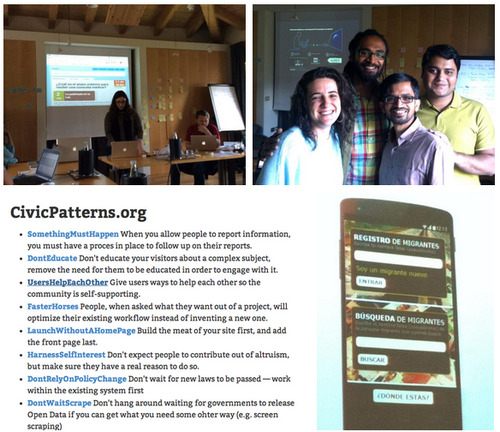 Before hacking, we should take a look at past projects (HackDash, Codeando México, Code for South Africa o Civic Exchange, etc), and participate in communities for collaborative coding like Poplus. Let’s collaborate horizontally: We know that Latin-American contexts happen to be very different when it comes to technological adoption, availability of open data, involvement of the communities and civic needs. However, civic hacking is international and we can have so much more in common (from which to learn and to inspire) if we approach countries remote in distance but close in problems. Here are some inspirations from communities in South Africa and Taiwan.